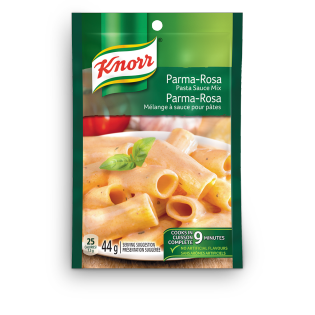 Our Parma-Rosa Pasta Sauce is rich and creamy with parmasan cheese and the mouth-watering aroma of tomatoes. Great served with rigatoni, rotini or penne. Dried tomatoes, modified milk ingredients, corn starch, hydrolyzed corn protein, modified corn starch, salt, wheat flour, dehydrated parmesan cheese, spices & herb, sugar, hydrogenated soybean oil, garlic & onion powder, canola oil, dried parsley, maltodextrin, citric acid, sodium phosphate, mono & diglycerides, corn syrup solids, colour, silicon dioxide and sulphites. 1. In saucepan, combine sauce mix, 1 ½ cups (375 mL) milk and 1 tbsp (15 mL) butter or margarine. 2. Bring to a boil over medium-high heat, whisking constantly. 3. Reduce heat to medium-low and cook 4 minutes, whisking frequently. Makes 1 ½ cups (375 mL) sauce. 4. Serve over 1/2 lb (250 g) cooked pasta. Makes 3 main dish servings or 6 side dish servings.